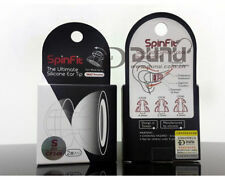 CUSTOMIZE THE SPINFIT EARBUDS. Dunu - DK-4001 In-ear Earphone. The unique A.C.I.S in the back cavity, together with excellent performance 13mm beryllium diaphragm dynamic driver, makes the low-frequency diving and sense feeling more excellent. With premium triple balanced armature drivers and one dynamic driver, the four-way DUNU DK-3001 provides an immaculate transient response. DUNU DK-3001 Premium Hybrid 4way In-Ear Headphones. Dynamic Driver (13mm). DUNU - FALCON C. DUNU Falcon-C Earphone. Dynamic Driver In-Ear Headphones. Driver: Dynamic Driver. Standard 6N single crystal copper silver-plated cable. Excellent carbon nanotube diaphragm. Using carbon nanotube diaphragm which with good rigidity and flexibility. Already awarded the Hi Res Audio certification, Titan 3 utilizes a 13mm diaphragm single dynamic transducer with titanium diaphragm. Tuned by our design team, the titanium diaphragm's signature transparency is pushed to its limit. The DUNU TITAN 5. DUNU TITAN5 Earphone. Bass has good quantity and deep reach. Mid-range has clean and sweet vocal. High-range is smooth and detailed. The “Hi-Res Audio ”certified Titan 5 earphone utilizes a wide 13mm titanium diaphragm, high power handling drier for its exceptional clarity, fast transient, deep reaching bass, sweet and emotional vocal, as well as the delicate and smooth treble extension. 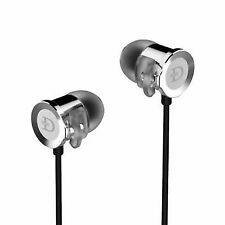 DUNU TITAN1 Titanium Diaphragm High Fidelity Quality In-ear Earphone. DUNU TITAN1 in ear monitor utilizes the top of the line dynamic transducer with nano class titanium diaphragm. the power of dynamic transducer, titanium diaphragm transducer is able to outperform both. DUNU TITAN1 in ear monitor utilizes the top of the line dynamic transducer with nano class titanium diaphragm. Different from the typical dynamic transducer, it is capable of perfect transient response while retains a nature yet energetic sound - with clear and delicate layering, thick and powerful bass response as well as amazing treble clarity that combined to recreate the impressive 'live' feeling of the music recording. Pioneering hybrid technology, the DUNU DN-2000 brings you astonishing audio performance. Pursuing perfection, it combines a dynamic driver custom-made by DUNU with a Knowles balanced armature driver. DUNU DN-1000 Premium Hybrid 3way Earphones. Committed to present the best audio performance, DUNU DN-1000 are designed to be the finest pieces in acoustic field. Cable 1.2m. Frequency range 16 Hz-22 KHz. Microphone: -45 5dB. High noise isolation can block ambient noise by 26db. Highly efficient dynamic speaker system. Noise Attenuation: 26dB. Excellent balance in frequencies with natural sound reproduction and smooth response. DUNU DN-1000 Premium Hybrid 3way Earphones. Committed to present the best audio performance, DUNU DN-1000 are designed to be the finest pieces in the acoustic field. Dynamic Driver (10mm). Drivers Dynamic(10mm). The Titan 5 earphone utilizes a wide 13mm titanium diaphragm, high power handling dynamic driver for its exceptional clarity, fast transient, deep reaching bass, sweet and emotional vocal, as well as the delicate and smooth treble extension. 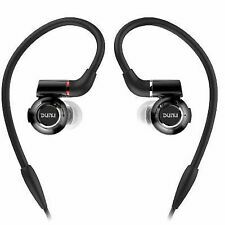 DUNU DN-2000J Premium Hybrid 3way Earphones. Not only does it have over 40 kHz of ‘HI-RES’ extension, the IEM is also capable of unparalleled performance across the full spectrum of sound. Now it will stay in your ears even without the help of the ‘shark fin’ concha-locking silicone accessories. Cord length: 1.2 m. ・ Driver type: 1 mm dynamic driver, 2 balanced armature. 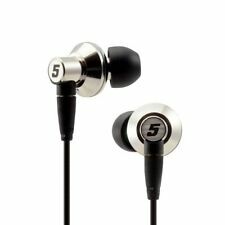 "Hi - Res AUDIO" certified TITAN 5 earphone realizes color of width, 13 mm titanium diaphragm, high power handling, brings high speed temporary, deep bass, sweet In addition to vocals of emotion, the extended function is included in delicate and smooth treble. 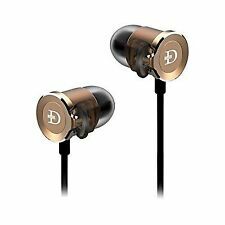 Premium hybrid earphone of balanced armature x3 dynamic driver x1, reproduction frequency: 5Hz ~ 40kHz, impedance: 13Ω, sensitivity: 110 ± 2dB, plug: 3.5mm gold-plated stereo mini plug (3-pole). Expedited (EMS). 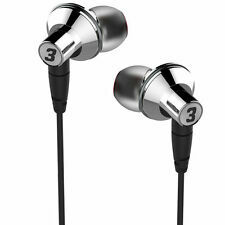 ・ Balanced Armature x 2 Dynamic Driver x 2 Premium Hybrid Earphone. DUNU DK-4001 DK4001 HiFi Audio Hi-Res Beryllium PVD 5Driver (4 Knowles BA 1DD) Hybrid Earphone with MMCX Detachable Cable. Driver: beryllium diaphragm dynamic driver and 4 Knowles balanced armature. Four driver Hybrid Earphone DK-3001. Perfectly combine dynamic&Balanced armature. Over the ear design improve stability of fittings. Type: Dynamic(13mm) 1 Balanced Armature 3. Hybrid electric drive technology. Titan 3 utilizes a 13mm diaphragm single dynamic transducer with titanium diaphragm. Tuned by our design team, the titanium diaphragm's signature transparency is pushed to its limit. The Bass is fast and with adequate quantity and clean impact. 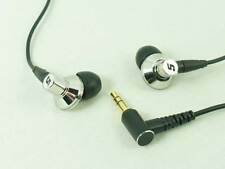 ・ 13 mm titanium diaphragm adoption canal type earphone with dynamic driver. ・ Plug: 3.5 mm gold-plated stereo mini plug (3 pole). ・ Reproduction frequency: 10 Hz to 40 kHz, Impedance: 16 ?., Sensitivity: 110 ± 2 dB. DUNU DN-1000.  DUNU DN-1000 Earphone.  You will experience the natural rich bass, excellent treble extension and crystal clear clarity. Moreover, its sound so fluent and distortion-free that you will be amazed. DUNU TITAN5 Earphone. Bass has good quantity and deep reach. Mid-range has clean and sweet vocal. High-range is smooth and detailed. The ear piece housing is made out of stainless steel, CNC’ed triple-polished to an elegant and durable finish. Fit Design In-Ear Canal. Sensitivity 108db Maximum Input Power. Frequency Response 10Hz�`40kHz Impedance 16ƒ¶. Condition New Unopened. We carefully check the condition of all. Our specialized fields are in rare Japan. 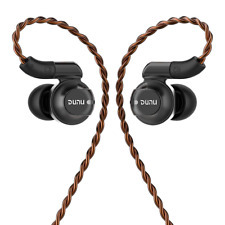 DUNU Titan 1es - In-Ear Headphones. The DUNU Titan 1es In-Ear Headphone uses a Nano class T-diaphragm driver producing prefect transient response while retaining a natural yet energetic sound, recreating an impressive lifelike musical experience. 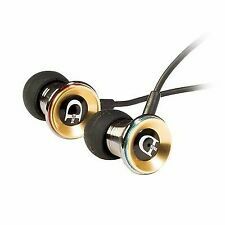 Specification: Type: Dynamic Balanced Armature(10mm ) Sound pressure level: 98 /-2dB Impedance: 10Ω Frequency Response: 16Hz-22KHz Noise Attenuation: 26dB Plug: 3.5mm Gold-Plated Cable Length: 1.20M Committed to present the best audio performance, DN-1000 is designed to be the finest pieces in acoustic field. Dunu dk-3001 earphone, Serial number : �Y. We are located in Japan. Driver Type: 10 mm Dynamic Driver 1 group, balanced armature 2 group | reproduction frequency: 4 Hz-40,000 Hz | output sound pressure level: 102 ± 2 dB | Impedance: 8ohms | Plug: 3.5 mm gold-plated plug | Code Length: 1.2 m | Weight : 21.8g. Premium triple balanced armature drivers produce perfect transient response while retain a nature yet energetic sound, to recreate a impressive life-like experience. Four driver Hybrid Earphone DK-3001.